Ce document au format PDF 1.3 a été généré par 3B2 Total Publishing System 8.06a/W / Acrobat Distiller 7.0 (Windows), et a été envoyé sur fichier-pdf.fr le 28/07/2017 à 23:41, depuis l'adresse IP 105.98.x.x. La présente page de téléchargement du fichier a été vue 579 fois. Taille du document: 294 Ko (8 pages). 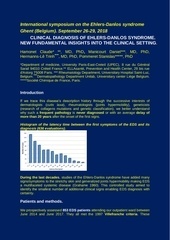 to suggest future directions for the promotion of accurate diagnosis and endotype specification. 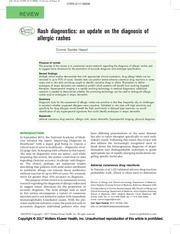 rashes and/or endotypes in atopic dermatitis. identification of any hyperspectral signatures that could identify endotypes in atopic dermatitis. strive for greater than 10% accuracy in diagnosis. appropriate use of rapidly emerging medications targeting specific molecules. medications in medically supervised drug challenges. some patients with atopic dermatitis in phase 3 trials. research is needed to clarify its applications. of medically supervised drug challenges. four developed reactions on oral challenge . the safety of such a procedure. continuance of allergy delabeling over time. was the only associated symptom. implicated genes in sulfonamide antibiotic reactions . absolute histologic criteria for the diagnosis of druginduced eruptions, and a skin biopsy may not definitively exclude alternate causes’ (7) (page 273.e36). go on to develop SCAR . possible confirmatory tests but poor screening tests. Atopic dermatitis is primarily a clinical diagnosis. classified into endotypes so that response to molecularly targeted medications can be predicted? recommended prior to initiation of systemic medications. may benefit from skin-centered approaches [46 ]. noninvasive biomarker capture would be ideal. try first in which patient. urticaria), treated appropriately, and offered medically supervised food challenges to avoid unnecessary dietary restrictions. cancer , oral cancer , and colon cancer . patients can be appropriately prescribed corresponding targeted therapies that are emerging. 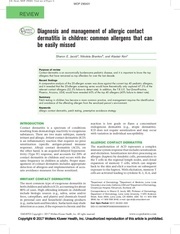 the field of allergy may benefit from similar exploration. 1. Balogh EP, Miller BT, Ball JR, editors. Improving diagnosis in healthcare. Washington, DC: National Academies Press; 2105.
of adverse drug reactions. Clin Pharmacol Ther 1981; 30:239–245. nonimmediate mild cutaneous reactions related to beta-lactam antibiotics. Pediatr Allergy Immunol 2016; 27:50–54. allergy de-labeling. J Allergy Clin Immunol Pract 2015; 3:365–434. antibiotic allergy in children. Int Arch Allergy Immunol 2016; 169:45–50. study in immunocompetent patients with delayed hypersensitivity to sulfonamide antimicrobials. PLoS One 2016; 11:e0156000. and phenotypical study. Br J Dermatol 2015; 173:50–58. determinants. Australas J Dermatol 2016; 57:e83–e87. and other beta-lactams. 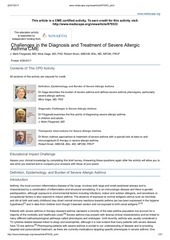 Clin Exp Allergy 2015; 45:300–327. reactions in HIV-infected persons. Br J Dermatol 2016; 175:150–156. Microbiol Infect Dis 2015; 82:172–176. lymphocytes and antidrug IgG in patients with beta-lactam hypersensitivity. atopic dermatitis: a systematic review. Br J Dermatol 2008; 158:754–765. of symptom measurement instruments for atopic eczema: a systematic review. more easily compared around the globe. dermatitis raised concerns that the long-term safety of using low and mediumpotency corticosteroids has not been well studied. assess the safety of topical pimecrolimus in atopic dermatitis. of infantile atopic dermatitis. Pediatrics 2015; 136:e1485. treatment of atopic dermatitis in infants. dermatitis. N Engl J Med 2016; 375:2335–2348. (SOLO1 and SOLO2) that demonstrate clinical efficacy and safety of subcutaneous dupilumab for the treatment of moderate-to-severe atopic dermatitis. treatments: a randomised, placebo-controlled, dose-ranging phase 2b trial. dermatitis. Immunol Allergy Clin North Am 2017; 37:123–139. dermatitis. Curr Opin Pediatr 2016; 28:456–462. study. Br J Dermatol 2016; 174:296–304. artemin. Nat Immunol 2017; 18:64–73. atopic dermatitis. Immunol Allergy Clin North Am 2017; 37:51–61. functionally and phenotypically discrete populations of resident and recirculating memory T cells. Sci Transl Med 2015; 7:279ra39. and rare diseases. Pediatr Clin North Am 2017; 64:39–56. 9788; pii: 978812. Epub 2016 Mar 29.
detection. Anticancer Res 2016; 36:3925–3932. and organs. Physiol Meas 2016; 37:2064–2078. degeneration. Retina 2016; 36 (Suppl 1):S127–S136. skin aging process. Appl Spectrosc 2017; 71:391–400. of intracutaneous allergic type-specific elements using long-wavelength nearinfrared hyperspectral imaging. Skin Res Technol 2013; 19:e157–e166. Ce fichier a été mis en ligne par un utilisateur du site. Identifiant unique du document: 00532696.